I was sitting close to Michael Maye (AKA Mayo Mick) in the stand at Healy Park yesterday and after Fionn McDonagh had lashed home Mayo’s second goal I remarked to him that I hoped he’d managed to snap a few photos of the young Westport player. I had an inkling by then that I might be needing one of them to adorn the piece I’d be doing tonight on our Man of the Match from yesterday’s game. So it has come to pass. Yesterday was Fionn’s first full appearance for the county in a competitive inter-county fixture – he’d also lined out for us in the FBD but a League match is always a big step up from pre-season fare – and he sure lit up a dull Northern day with a sparkling debut. His 1-3 contribution to our 2-13 total was eye-catching but what was more satisfying was his overall contribution to the play. He tracked back repeatedly, he got stuck in and tackled well, he was out in front showing for ball and, when in possession, he provided ample evidence of his burning pace. As first appearances go, this one was very impressive and he wins this week’s Man of the Match award with a decisive 40% of the vote. But yesterday’s win was not, in any sense, a one-man show. Far from it, in fact, as the team as a whole put in a hard-working collective display. Chief among the other prominent performers for us yesterday at Healy Park were Keith Higgins (21% of the vote), Andy Moran (7%), Aidan O’Shea (6%) and another debutant, Ciaran Treacy (5%). Congrats to them all. By the way, Fionn McDonagh was named as MOTM by TG4 yesterday and he’s also now been shortlisted for the GAA’s Footballer of the Week award. 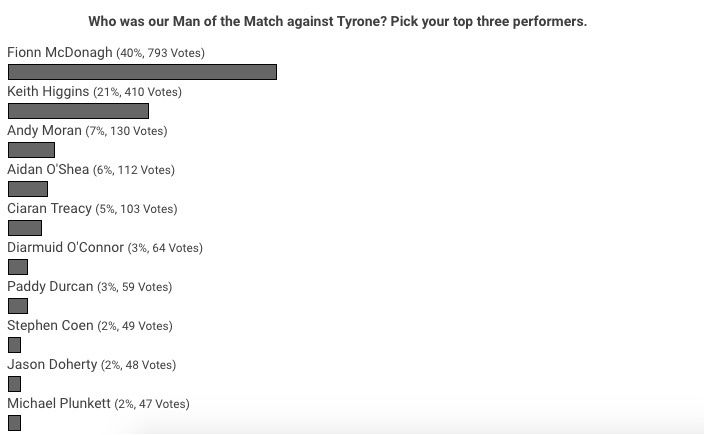 Several Mayo players have followed up winning the MOTM poll here on the site by scooping the GAA award too so if you’d like to help Fionn on his way in this regard you’ll find details on how to vote for him here. Voting takes place on the GAA’s Instagram page (here) and the poll closes at 10am tomorrow morning. Best of luck to Fionn in that one. Well deserved. Great pic Mayo Mick!! Dont vote for him! Say nathin, keep it quiet. With everything remarked, I have to say I was also impressed with Brian Reape, very unselfish in his work and support play. Thought the way he dragged his man around opened up space for our other forwards. A very good outlet for ball and everything stuck, a very promising league in prospect! Imagine the panel and options we’ll have if we can get Ryan O D Cian Hanley James Durcan Seamus O Shea and Maybe Tom Parsons full fit for the Championship and not forget Cillian and the newbies continue to progress and Coen and Harrison continue to grow in their roles. I hope Reape, McDonagh and Treacy continue to improve. Ryan O Donoghue, Durcan and Hanley are also being mentioned. It looks like JH could have big decisions to make come championship time. If we assume that Diarmuid will be in midfield the question is who of the previous forwards might lose out – Aidan O Shea, Kevin McLoughlin, Jason Doherty, Cillian O Connor or Andy Moran? They are all very good players and it will be hard for a young lad to dislodge any of them. Aidan O Shea might end up in midfield which would create another spot. We might see a bit of ‘job sharing’ like the Dubs. Interesting times ahead! Backdoorsam – and if Robbie and Drake (as Corner Back) show like they did last weekend / FBD respectively that’s another get pair of options. Not to get too carried away just yet! 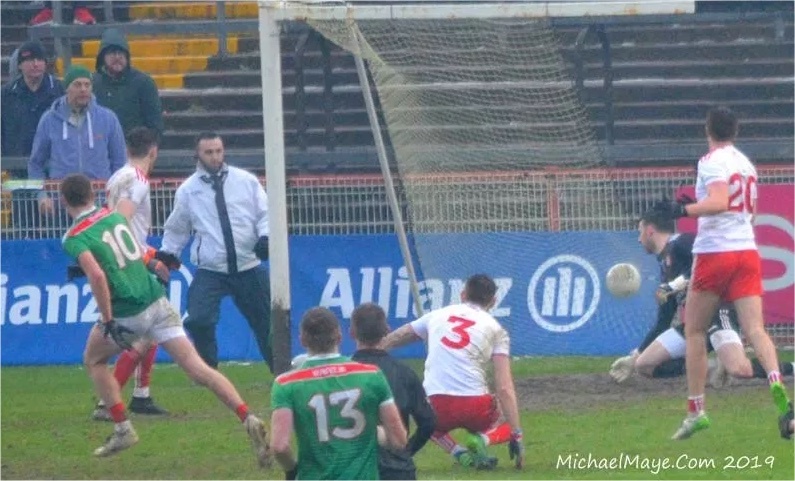 Yeah, another great picture from Michael Maye,… but the photo with Zippy scoring his Goal is even better in my opinion… Great goals, Great pictures, hopefully more to come next Saturday.. . Happy Chinese New Year to everyone! A very interesting aspect of all of this is that there are different types of players for different roles in the team. Probably nearly better to talk about roles these days as the numbers on the back/positions are so mixed up. In defence with everyone fit well it’s simply a lot of options. We have had plenty options in other years, but, something a bit different this year with the potential subs also being strong in-form players. Midfield I think we may end up sticking with Diarmuid and Donal Vaughan. Those two give a work rate, tackling, passing whilst still having physical size that is maybe a perfect blend. Their one weakness and it’s mild enough is in not being strong midfielders on the kickout, however with Aidan around that area as a 3rd midfielder I don’t believe it to be an issue. The modern game requires huge workrate, passing and chipping in with the odd score from the midfielders and Diarmuid and Donal are probably best to provide that overall package. The forward line, again like the backs with everyone fit you are looking at a strong pick of players. The big difference being that the potential subs whomever they may be are likely to be strong in-form players. It’s early days but I honestly think in the modern era we haven’t had as strong a squad as this. It seems like the older or high mileage players like Andy, Keith Higgins, Leeroy, JDoc, Aidan, Kevin McLoughlin, Boyler and SOS are all still fit and ready to contribute. Yes, it would be natural they would lose a shade of pace compared to their absolute physical peak of 25/26 but with the tactical nature of modern Gaelic football you can make up for that with composure and tactical nous. Confidence in big games, it really only can come from having played regularly in Croke Park. Jason Doherty, Aidan, Boyler are playing better and smarter football now than when they were 25/26. If you look at Dublin a lot of their football is played at 3/4 pace but it’s done with composure and intelligence. Of course there is pace injected by the likes of MccAffrey, Mannion, Fenton but if you watch the likes of Mccarthy, McMahon and Scully they are playing with their heads more than their legs, meaning they are not all out effort on each play. An interesting thing on second viewing is to watch all the scores Brian Reape setup in the game, I think it was 4 pts in total. Thought he should have had a free also for being held back in front of goal but the free was brought back advantage to JDoc out on the sideline. He will learn a lot from a game like that in terms of bringing other players into the play. If he was only operating as a scoregetter in each game it would make him vulnerable to being shutdown by a tight man marker or suffering in a blanket. A game like against Tyrone will help him broaden out his match skills to also being a provider of scores. Really liked Michael Plunketts contribution, he’s such a tidy player almost like a soccer playmaker out from defence. Anyone got any inside info as to why Aidan does not go in for the throw-in ? Can’t see the reasoning behind it. Well done Fionn and what was a very fine performance. Keep it going. Were there any injuries from Sunday ? I noticed Diarmuid walking off a bit gingerly but hopefully this was only slight knock. Well said toe to hand . The hype is already starting with a couple of articles by donaghy and Bernard flynn . I dread to think of what will happen with the hype machine if we happen to beat Cavan and then pulled off a shock Victory v Dubs . Paddy Durcan should be given a couple of games at midfield if we get to 6 pts after saturday night. Exactly Toe to Hand….I even think Sean rice post match comments were a little over the top. He used the word ‘ecstatic’. Imo that’s more than a bit over the top. It’s one league game in early February. Mcdonagh had a good game. He was left with acres of space for the goal and one of his scores. He missed a sitter just after half time. He worked hard and it was a very encouraging performance but wow are people getting way too excited. Tracey did ok. Hit a nice long range score but isn’t that what forwards are meant to do? Toe to Hand is exactly right. Keep the powder dry. You really can’t form an accurate judgement on a player until championship…when it really matters. That being said, a guy has to perform to a certain standard in the league to merit a championship slot. Let’s see how the lads do in tralee and the dubs. Those will be decent tests. What on earth would Mayo supporters/media do of we had Sean O Se scoring 12 points away in Cavan??? The place would go into meltdown meanwhile in Kerry the majority reaction is, that’s what’s he’s meant to do. I stand to be corrected but i think only 2 of Sean O Se’s points were from play. He’s a fantastic player no doubt & a fabulous free taker to boot & I am not trying to downgrade his performance in any way. Loved the manner of the win on Sunday and the way the entire team went about their business. This team … and especially the new younger guys with pace to burn … will be actually more effective on a dry sod. That performance blew me away. The pace of our transition from backs to forwards with fast incisive passing made Tyrone look very ordinary. And there is no reason why we cannot improve … and keep the panel fresh. I for one am looking forward to a long summer. My only word of caution is that we have to make sure AO’S is kept fit right through the year. I reckon last Sunday was one of his best performances. He is pivotal. Didn’t get to watch UCD and DCU but a report I saw had Coen at CHB and Paddy Durcan and Akram playing for DCU. No mention of Ruane or Reape but a M Hall did come on as a sub [for DCU, I think]. 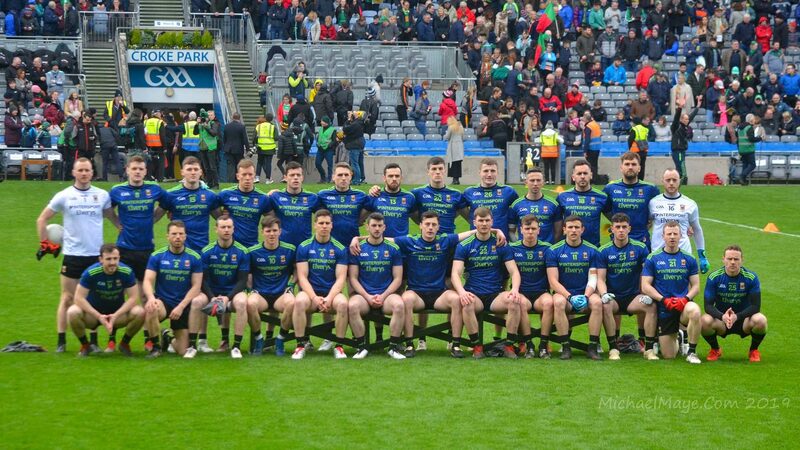 great display but its early days….will be interesting to see team to play cavan…..is it time for a new team picture? It is, Quay School! Getting one that looks well is the issue but every time I look at that 2017 – and, as you’d imagine, that’s fairly often – the same thought hits me that it’s time for a change there.